The hinged door shown is produced with an alu/corecell/alu sandwich panel to produce a HD light-weight closure capable of supporting loads upto 7.5 lbs/in�. Nova technology makes this door waterproof and installation with clamp-type trim eliminates the need for interior finishing, as well as reducing installation time to a minimum. Available in both mill finish or polar white paint. The Nova collision bulk-head door has the same construction as the Nova hinged door except the pannel is produced from 0.25" to 0.325" aluminum. Depending on size CB Door will also be laterally reinforced. 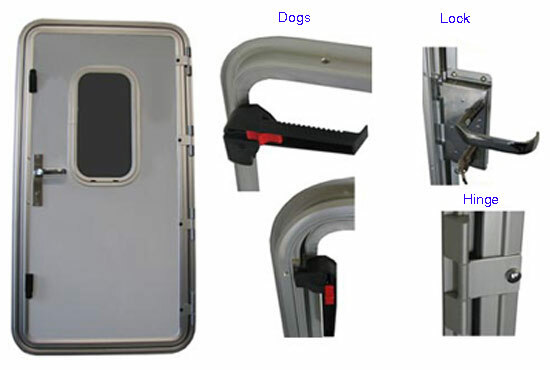 Dogs are also located in hinge area, assuring waterproof seal even after hinge failure resulting from collision damage. SEE HOW our door works!